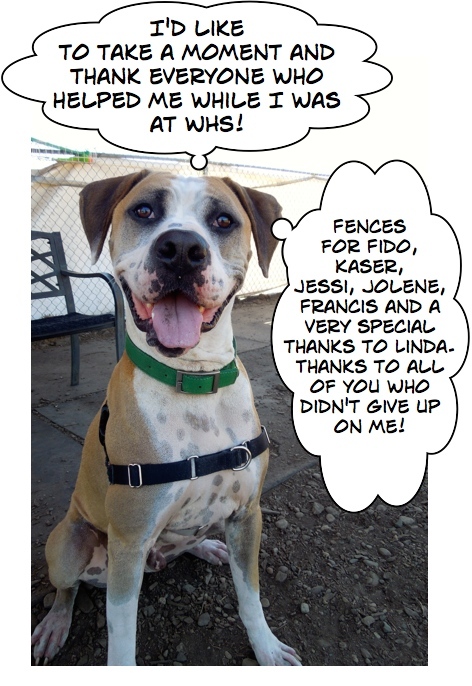 The reason this time of year is called the Dog Days of Summer may be because of the terrific adoptions we’ve had at WHS this week! 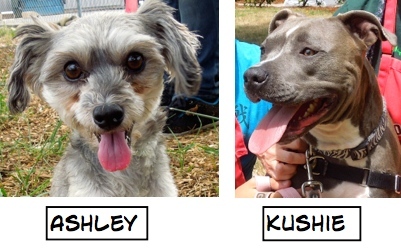 Here are the Blog Dogs who are now enjoying the love of their new families. 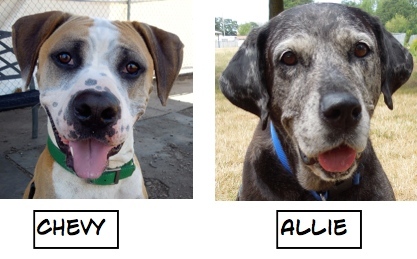 I was so happy that ten-year-old Allie was adopted so quickly. 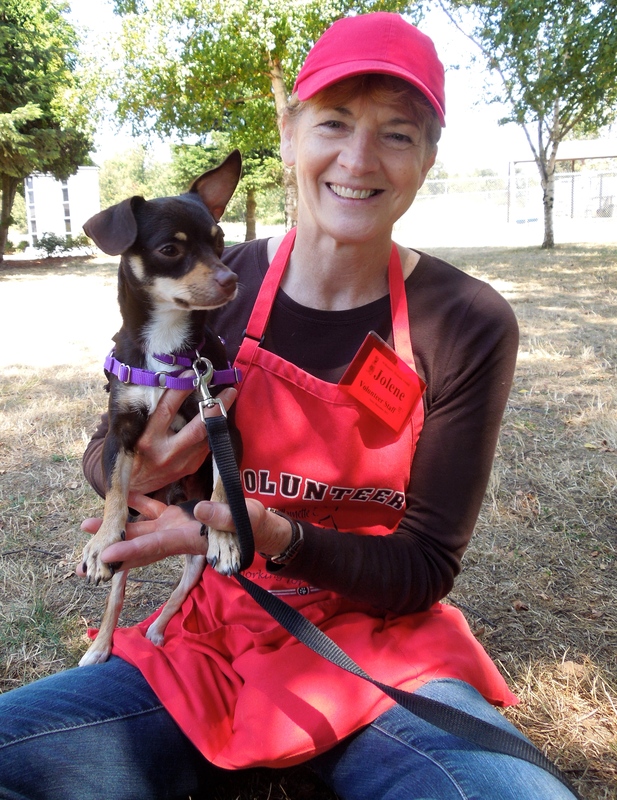 We are always thankful for adopters who open their hearts and homes to our seniors. One of the most joyful adoptions in a long time happened late Monday. 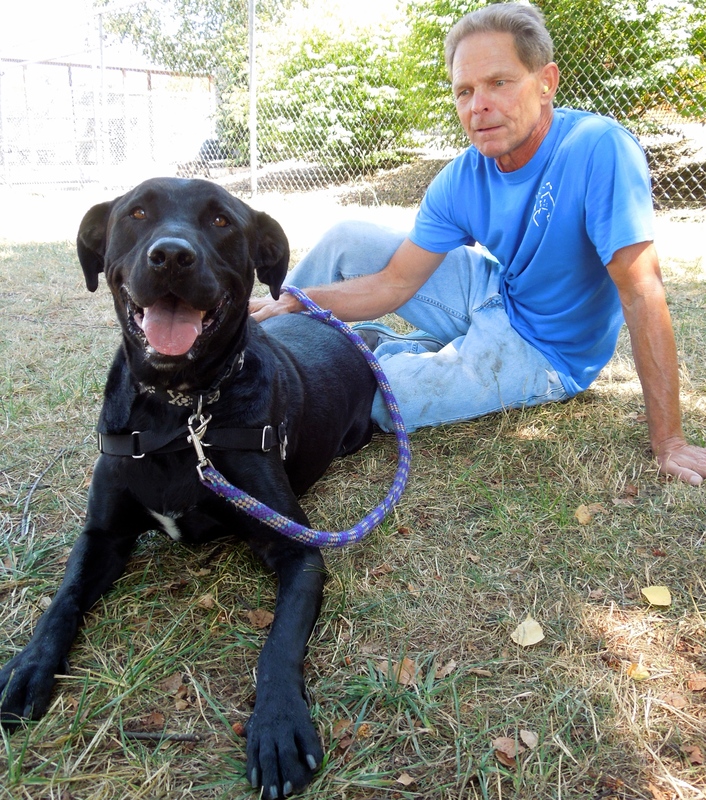 Chevy arrived at WHS last March. Fences for Fido had rescued him from life on a chain where he had lived during the first three years of his life. His first adoption was not the right fit, and so he came back to us. 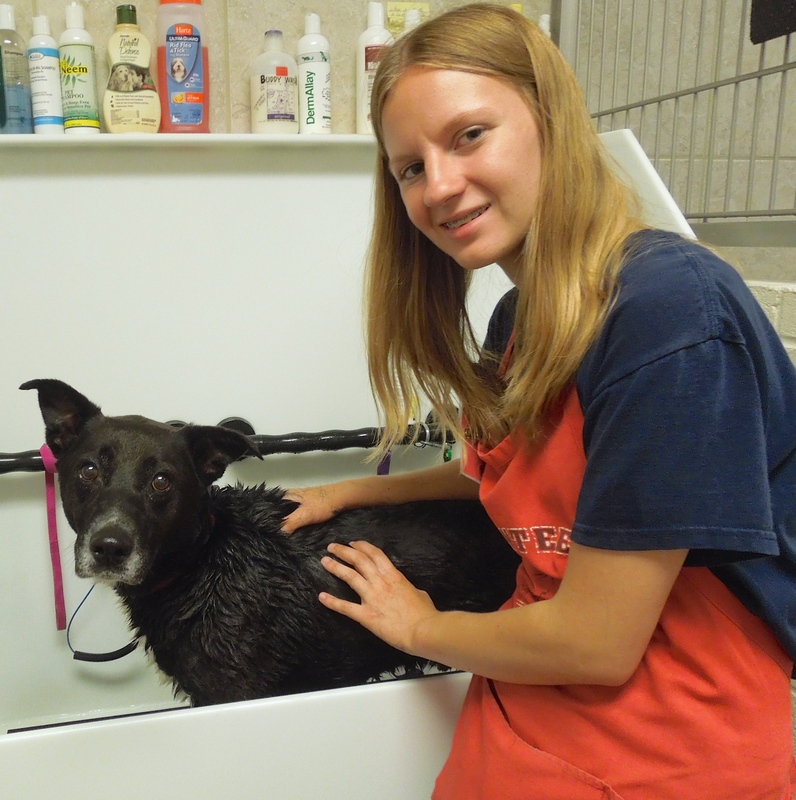 With the help of volunteers, Chevy began learning needed skills through classes both at WHS and at My Dog’s Gym. Monday his hard work paid off and he went to a new home and a fresh start. Being Chevy, he had something he wanted to say before he left. Another wonderful adoption happened on Sunday while I was at the shelter. 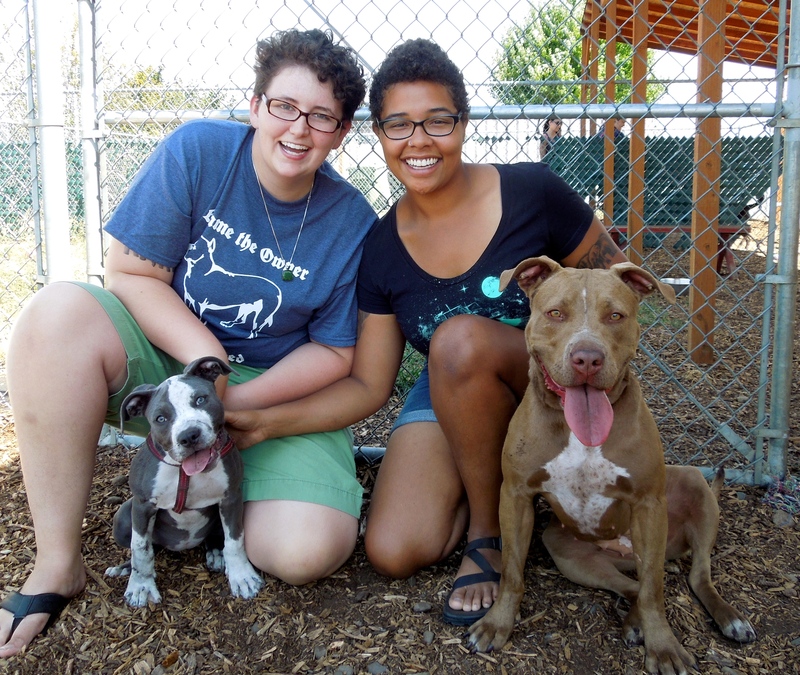 Arielle and Molly brought in their adorable Pit Bull puppy so she could pick out a sibling. 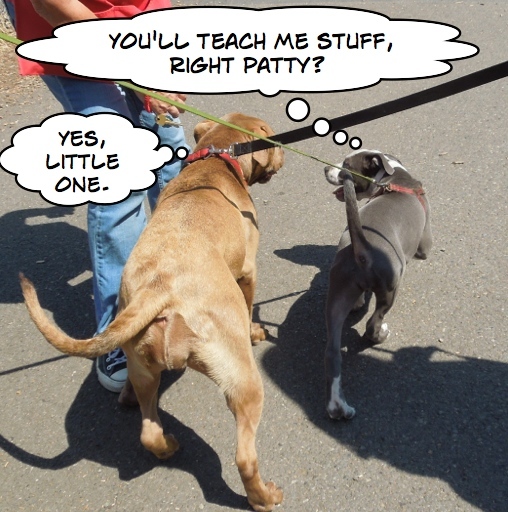 And the one she picked to become her big sister was Patty! Here is the happy family before they left. As we walked back inside after the play date meeting, I overheard the following exchange. Yes, I really am this cute! 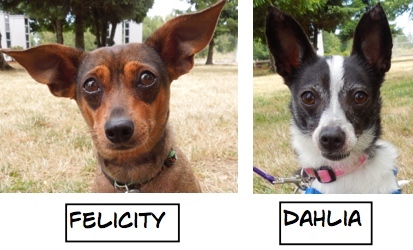 I met several new dogs at the shelter on Sunday. 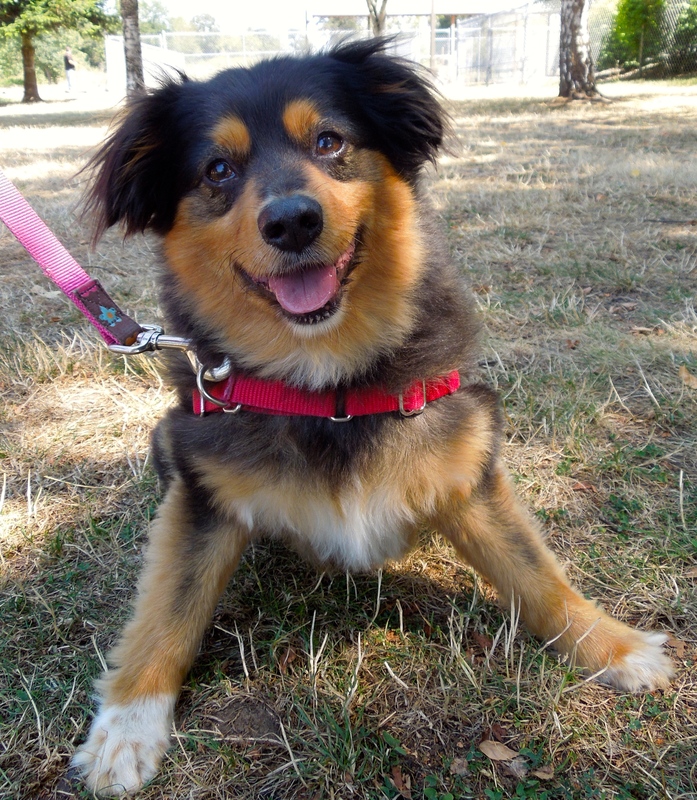 First was Scamp, an eight-year-old, 27-pound Mini Aussie. 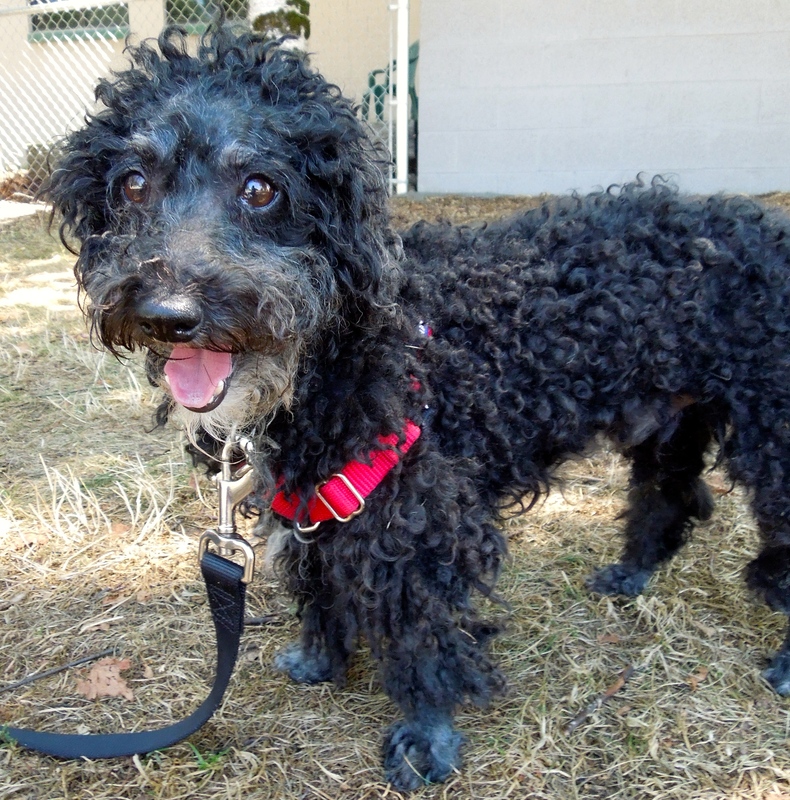 Scamp is a very happy little character who loves to play, go for walks and hang out with his people. He does not care for small children, however, and should go home with adults or a family with older kids. Here he was with Jolene, and yes, he really is this cute! I was here when I was a mere pup. Now I’m all grown up and need a new home! Yours? 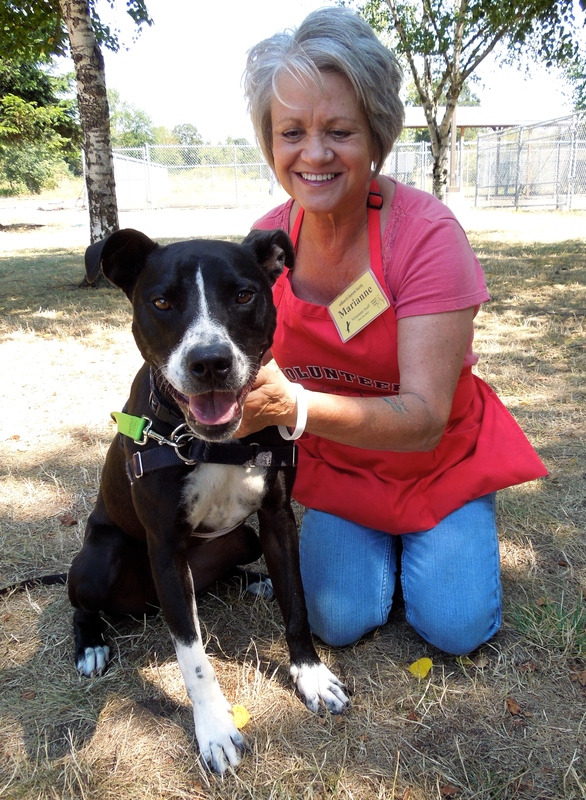 Marianne could hardly wait for me to meet Juno, a two-year-old Pit Bull Terrier/Border Collie mix. Juno is pretty much the perfect dog. 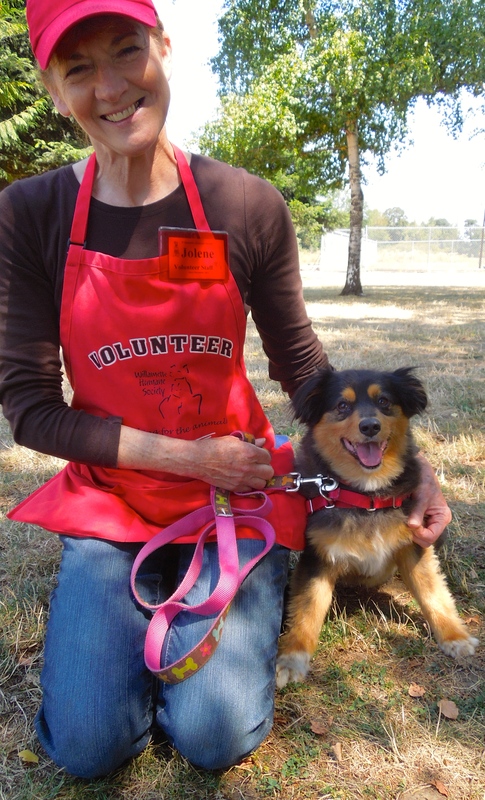 She scored excellently on her SAFER test (the behavior assessment WHS gives every new dog) and would be a great dog for a first-time dog family. 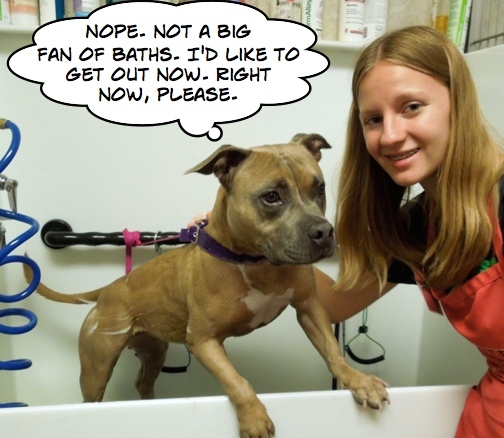 Actually Juno has been at WHS before, when she was a puppy from California. Here she was on Sunday with one of her biggest fans, Marianne. I’m a little older than some, but so over all that puppy drama! 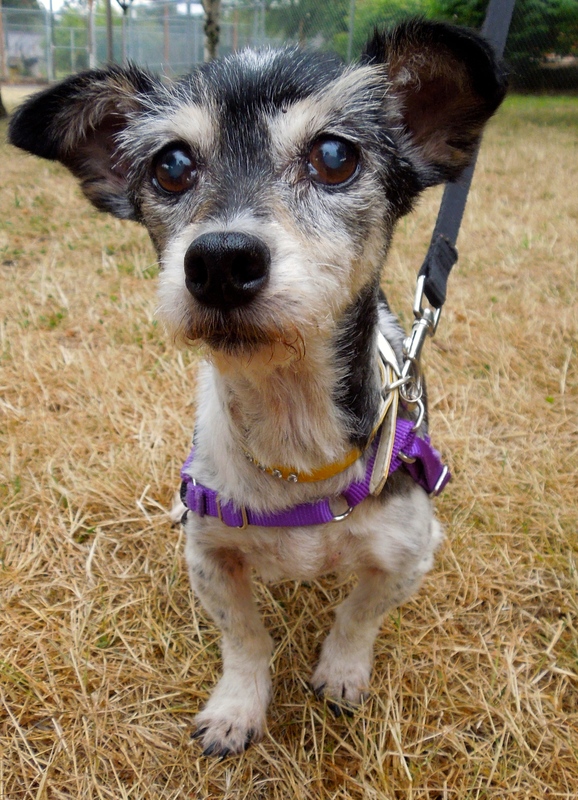 This is little Aires, a ten-year-old Terrier/Chihuahua mix who is looking for a quiet and calm home. 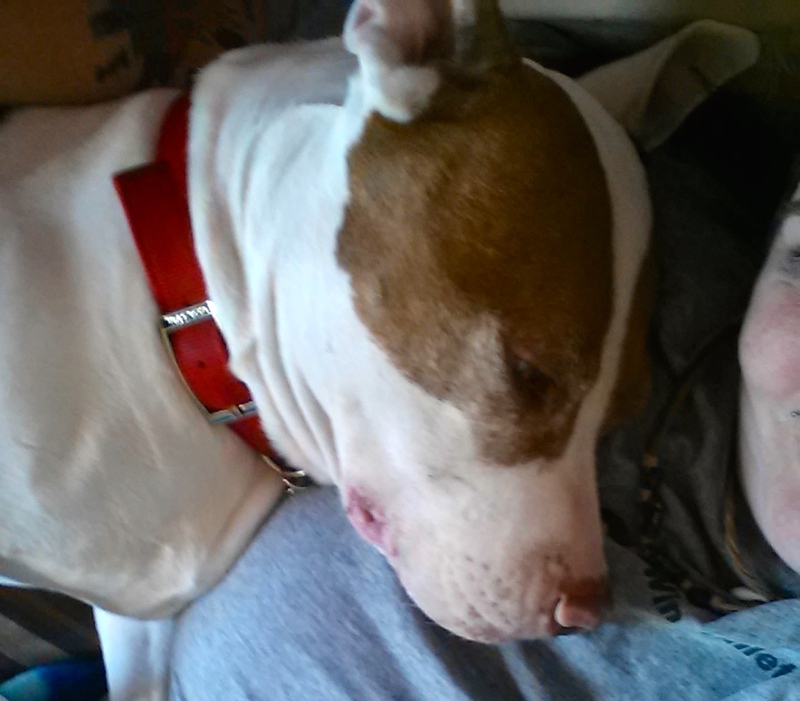 At only nine pounds, she is quite the cuddle bug as Bruce found out on Sunday. 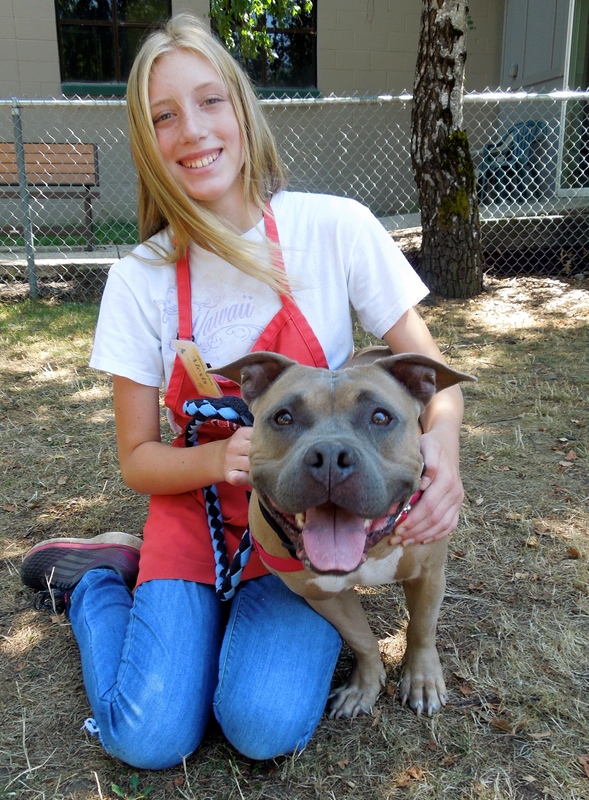 Aires is one of our California dogs who is looking forward to spending her senior years with a new Oregon family. She really is a sweet little girl who wants to be your best friend. She has such sincere eyes. I’m back. I’m hoping for a new beginning. 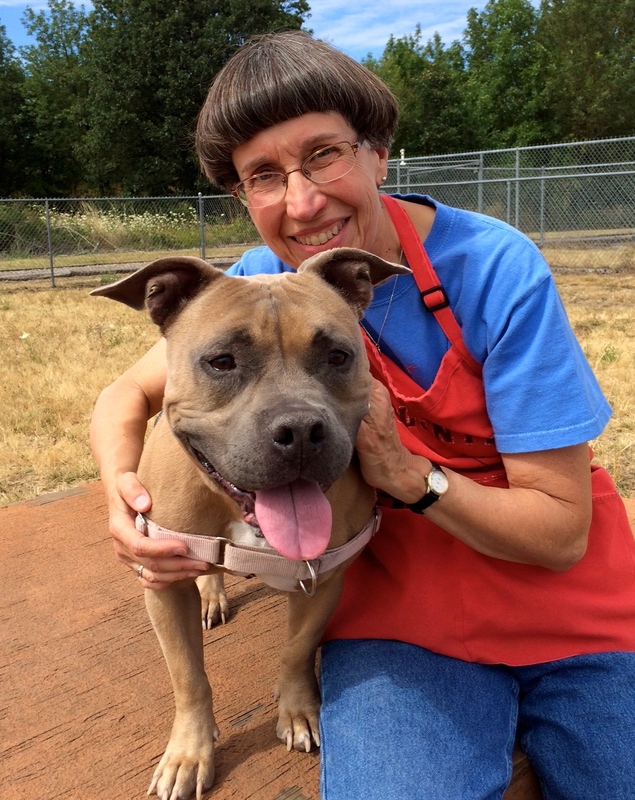 One of my all-time favorites, Destiny, is back at the shelter. Her family couldn’t keep her anymore. When I found out she’d been returned, I made a special trip to WHS so I could spend some time with her. We went out to the big yard and she loved the smells and just hanging out together. 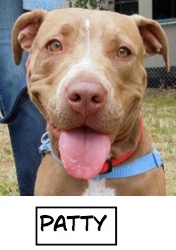 Destiny is a three-year-old Pit Bull Terrier mix who came to us as a START dog last December. She has been adopted twice. The first time it was quickly discovered that she cannot live with cats. She finds them too tempting to chase. 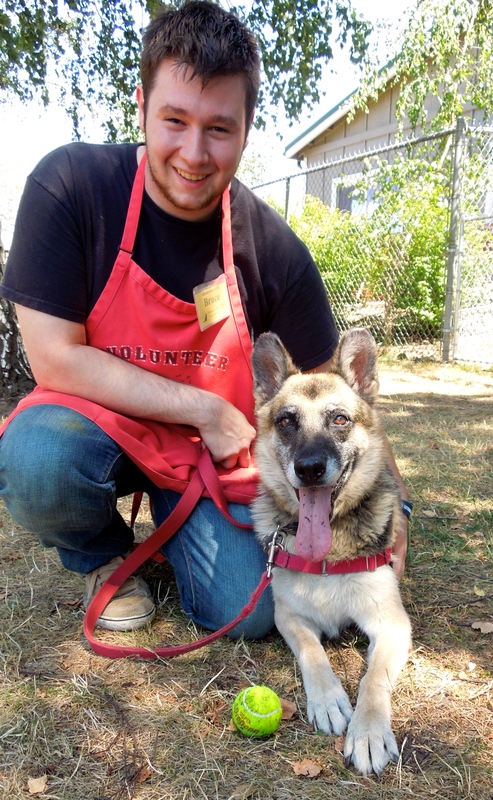 Destiny is looking for a family who will become her forever people. She rides great in my car, calmly looking out the window or lying down. 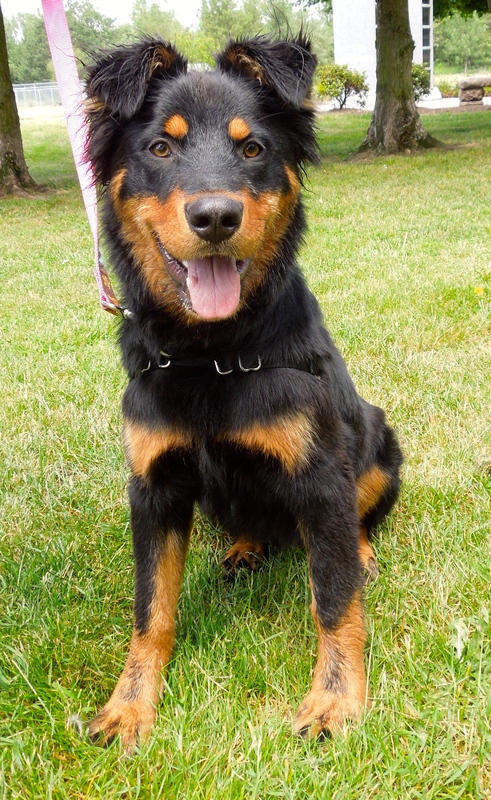 She will need a patient family who will help her with house training, as she needs consistency. I’m hoping that she won’t have to stay at the shelter too long before finally finding her right fit of a family. Here she was on Sunday with Alexis. I just love her happy expression. Today Destiny needed a bath and Emelynn and I happily gave her one. Destiny wasn’t thrilled with the idea, but was cooperative and only complained once. What do you mean, my ears don’t match? This little cutie is Tenor, a two-year-old, eight-pound Chihuahua mix who was found as a stray. People reported seeing him running around for a week before a kind person picked him up. While we don’t know his history, what we do know is that he is a fun-loving, happy little guy who likes to play, go for walks and snuggle with people. Don’t quite understand his one-ear-up/one-ear-down look, but I do know he will make some lucky family a great new addition. 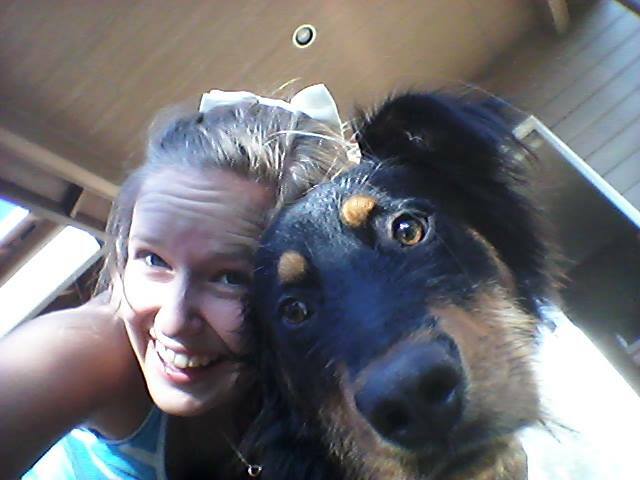 Jolene and I think Tenor is a keeper! Bryan says I’m a great dog. He’s right. Want to adopt me? I met Draco for the first time on Sunday and instantly loved this happy boy. He was found as a stray, so we don’t know his history, but what a wonderful dog he is. We think he is about five years old and is a Border Collie/Lab mix. If you know any Border Collies, you know they love to have a job to do and to keep busy. Draco would love an active family who would take him on adventures…maybe camping? Jogging? Agility? He takes treats gently, walks very well on leash, and is just a super dog. Here he is with Bryan. Today he needed a bath, also, due to his dry skin. He couldn’t have been a better behaved boy during the entire process. He didn’t like it, but took it like a champ. I can’t believe he doesn’t have a hold on him already. He’s going to make some lucky family a fantastic new best friend. I really needed a hair trim. Then I got one! 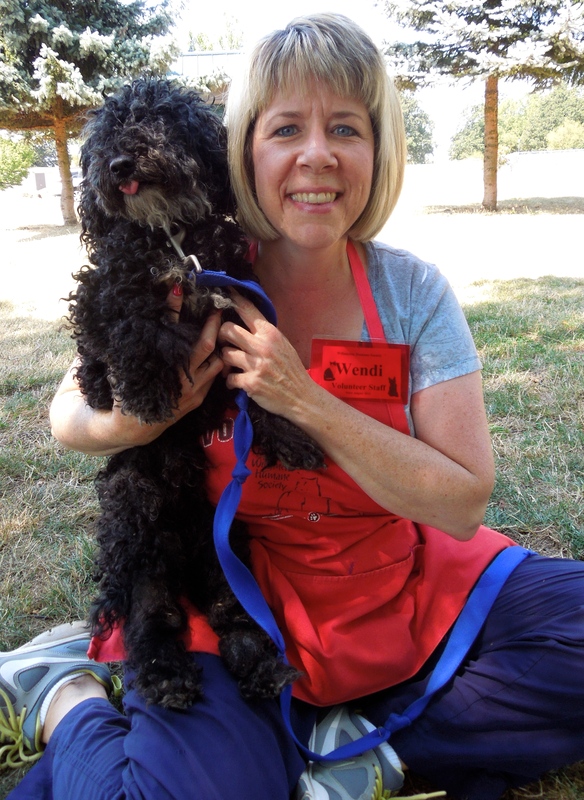 Gandalf is a seven-year-old Miniature Poodle weighing 11 pounds. He also came to us as a stray, so we don’t know about his past, but he seems to get along with other dogs, is affectionate, took my treats gently and seems to be a laid-back, easy-going kind of guy. Here he is with Wendi on Sunday. The only problem with taking pictures of him was trying to see his eyes through all of his hair. 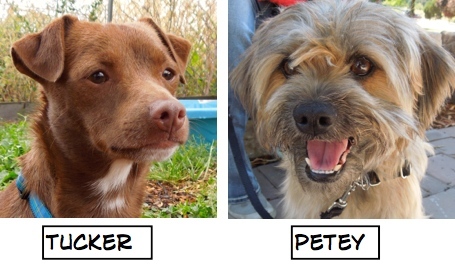 But today when I arrived at the shelter, I saw a totally different looking dog! I’m sure he likes that he can see now! I think I’m going to like Oregon. One of the new S.T.A.R.T. dogs from California is this beauty. 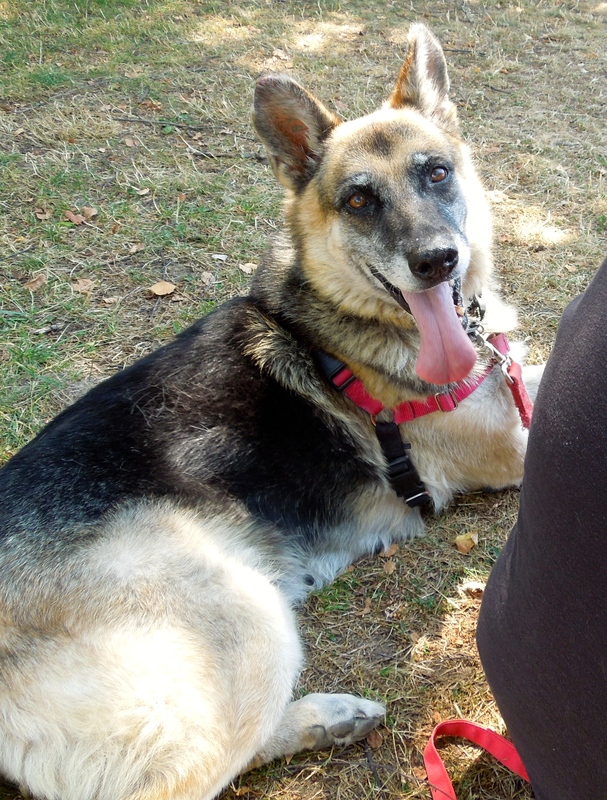 Meet Pearla, a seven-year-old German Shepherd mix. 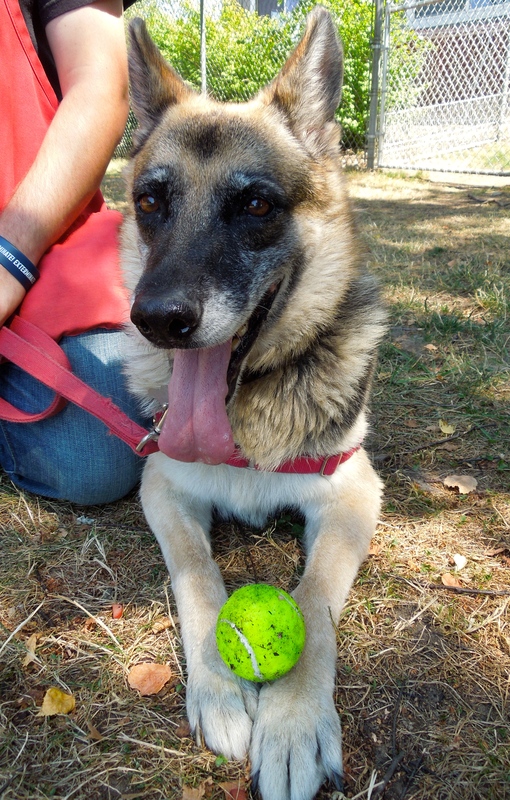 Are you looking for a partner to play fetch with? Look no further! Pearla LOVES tennis balls whether she’s chasing them, returning them, or just carrying one around. 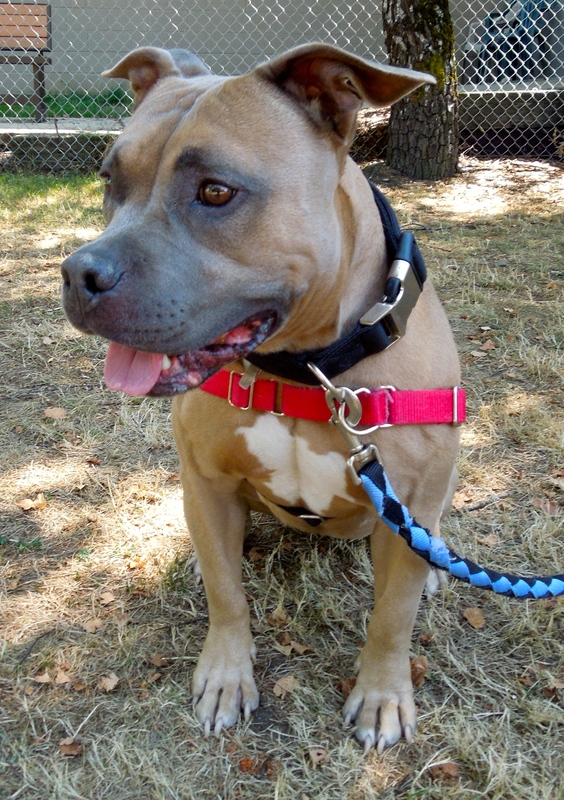 She’s a gentle, big-hearted gal who is hoping for a family who will take her for walks, play ball, and in the evening let her curl up at their feet. 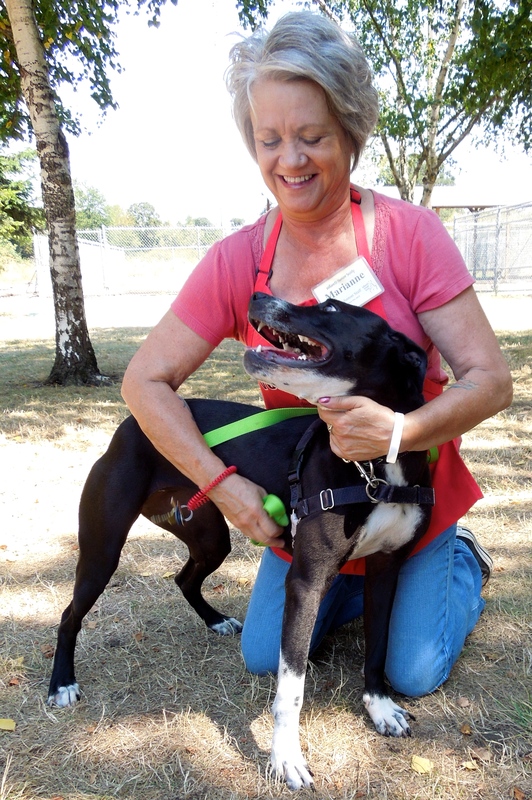 Bruce really enjoyed spending time with Pearla, as did I.
I’m still here waiting for you at the shelter. Need directions? Rocky is a four-year-old Lab mix who has been at WHS since early May. He came with a group of S.T.A.R.T. dogs from California. When he arrived, he had some food-guarding issues which needed to be worked on before he became adoptable. 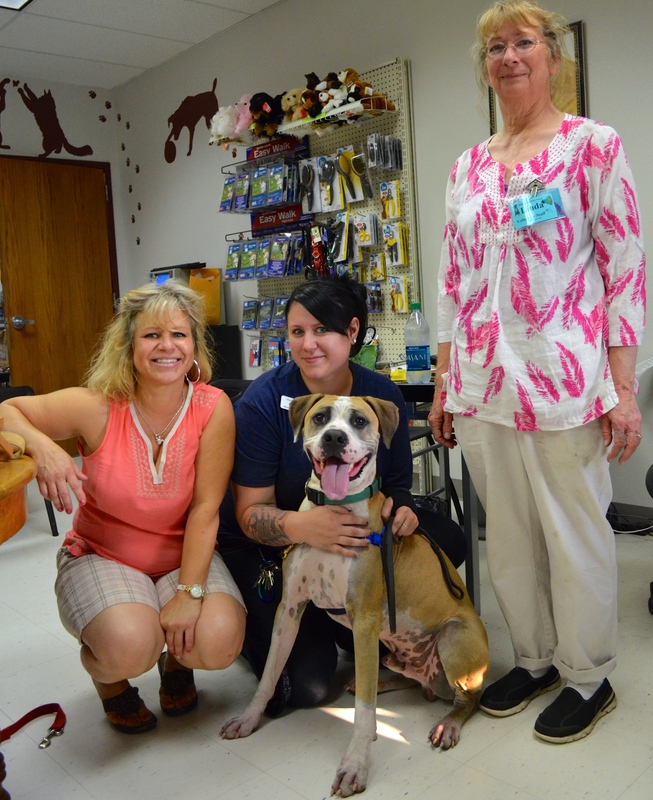 Staff and volunteers have helped him and he has improved greatly. 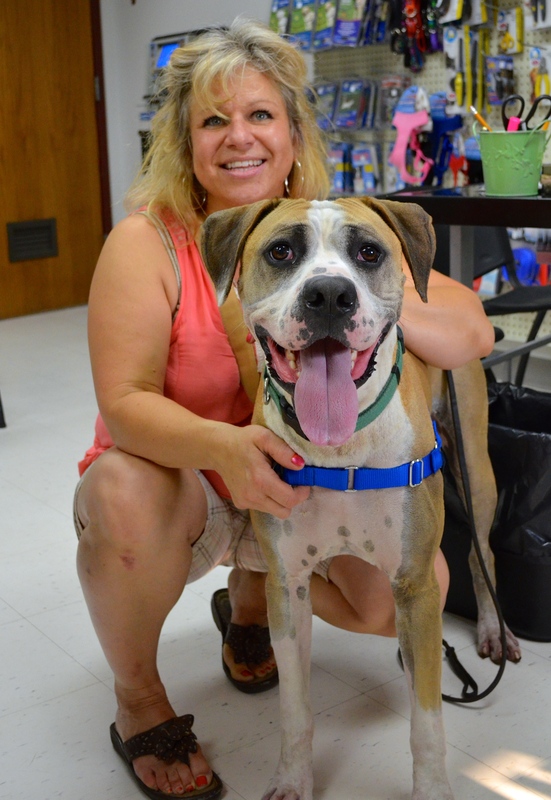 Rocky has a ton of energy and will do best with an experienced owner in an active family without young children. 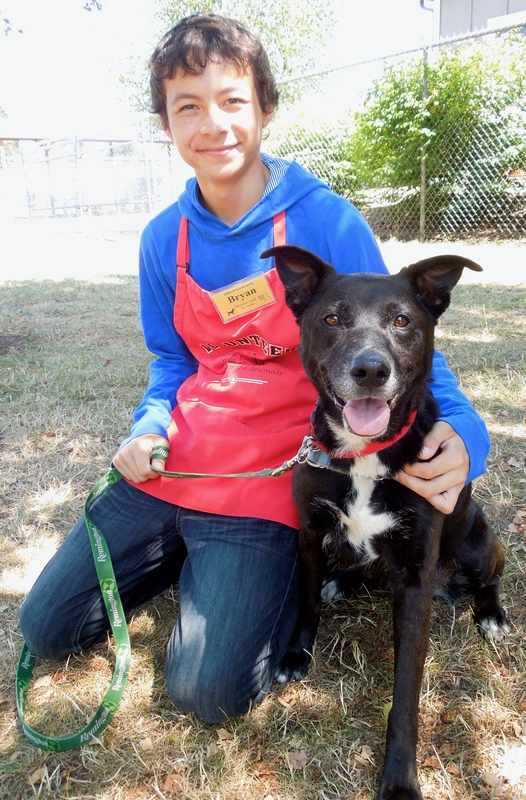 He is house-trained and really wants to be a good dog with a home of his own. Even though he has been at the shelter for so long, he has never given up the hope of a real home. He remains optimistic that any day now, his forever family will find him. I’m an eager boy just waiting for my chance to be someone’s new best friend! 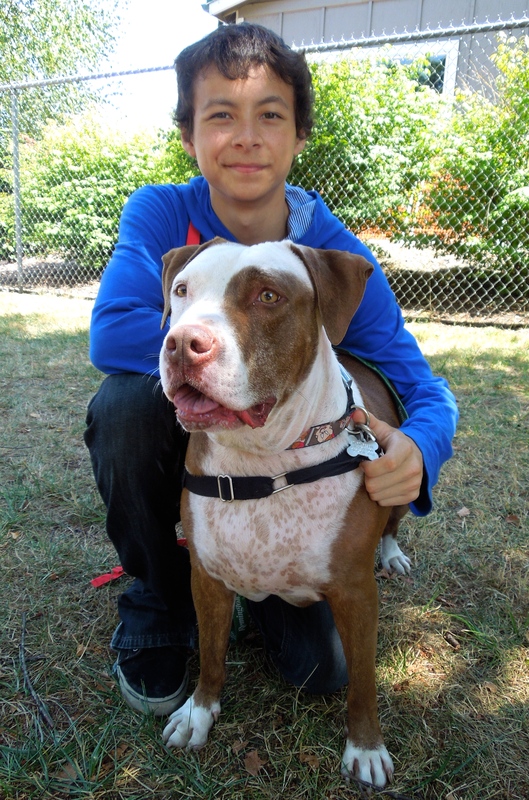 Bryan spent some time with Maximus, a three-year-old Pit Bull Terrier mix, on Sunday. This big boy (66 pounds) didn’t like to look directly into my camera, and pretended that I wasn’t sitting right in front of him. He’s another S.T.A.R.T. 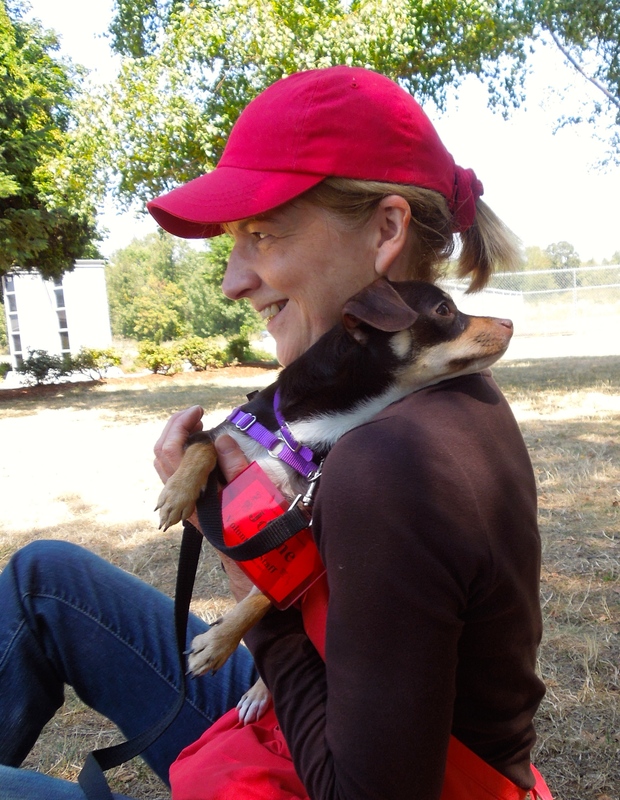 rescued dog, hoping to make a forever home in Oregon. He doesn’t like being in the shelter and can’t wait to meet his new family. Brutis is a newbie to the shelter and Emelynn and I met him for the first time today. From the moment I entered his kennel, I knew this guy is just about perfect! 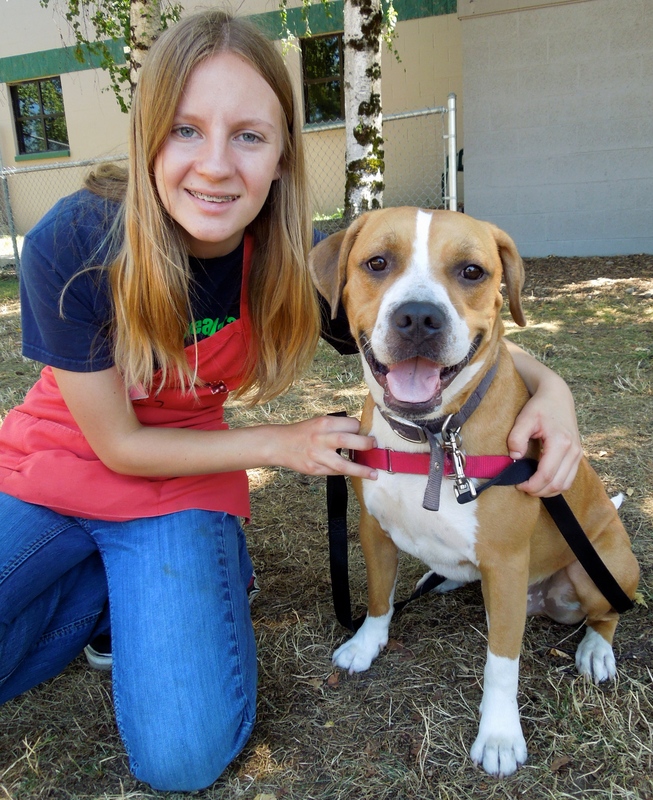 He’s a two-year-old Pit Bull Terrier/Beagle mix and is an extremely gentle, mellow boy. He sat politely while I put his harness on, he walked perfectly on leash, and he happily posed for my pictures while munching on my hot dog bits. 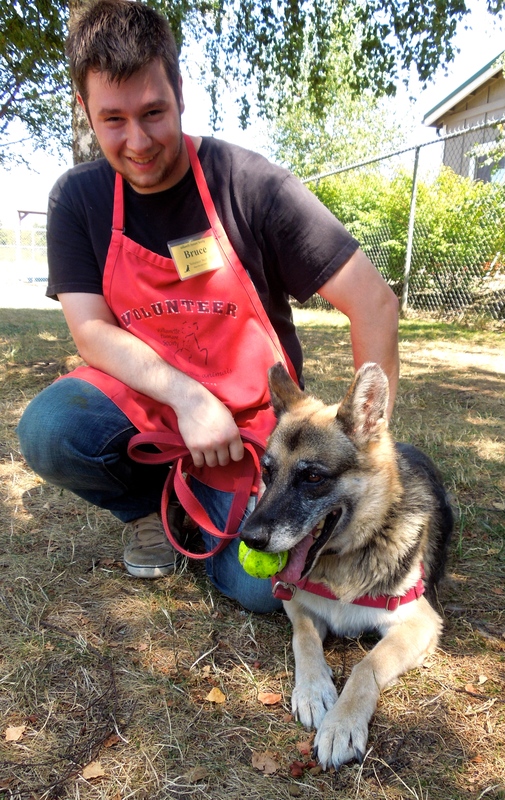 Brutis is house-trained, gets along with other dogs, and has a good history with small children. Could he be any better? I think not! I am sure this sweetheart will be adopted quickly by a very lucky family! I got to go walk in a park today! Remember smiley Riley from last week’s post? 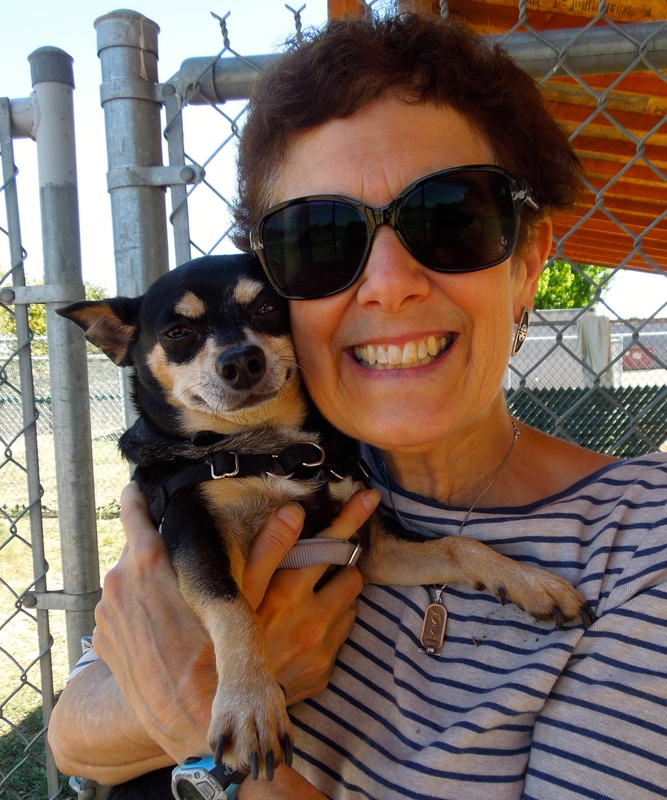 Well, this afternoon, I happened to see volunteer Joan returning from a respite to Minto Brown Park with this lucky boy. She reported that once he got the hang of being in a park, he really enjoyed his walk. Riley is an eight-year-old Chihuahua mix and as you can see, he’s still smiling! What do you mean you can’t see Caroline? She’s right next to me! I had to laugh when I asked Caroline to pose with Bruno today. This is what I got. 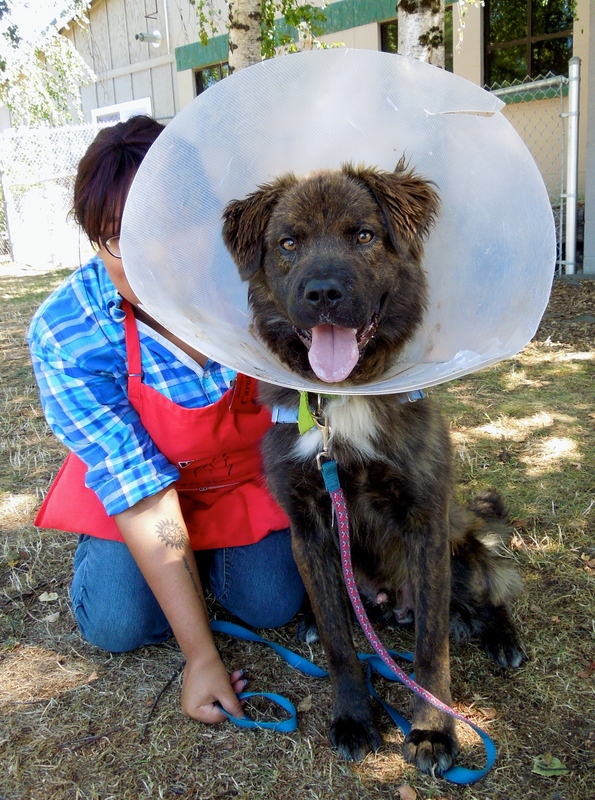 Bruno is a one-year-old Dutch Shepherd mix who is extremely active and would love to take some training classes to polish his manners, which do need some polish! His youthful enthusiasm can be a tad overwhelming, but he has a good heart, an eager mind and will grow into a wonderful boy. He loves to learn, loves to play and loves everyone he meets. He’s a goofy, fun character. Here is my picture of Scrappy when he was at WHS. What a cutie! “Here are some update pics of Scrappy. We adopted Scrappy back on June 5th. Scrappy has been a perfect fit for our family. We are a family with 3 very active social teenagers. We constantly have teens coming and going in our house. Scrappy has been marvelous welcoming all who enter. 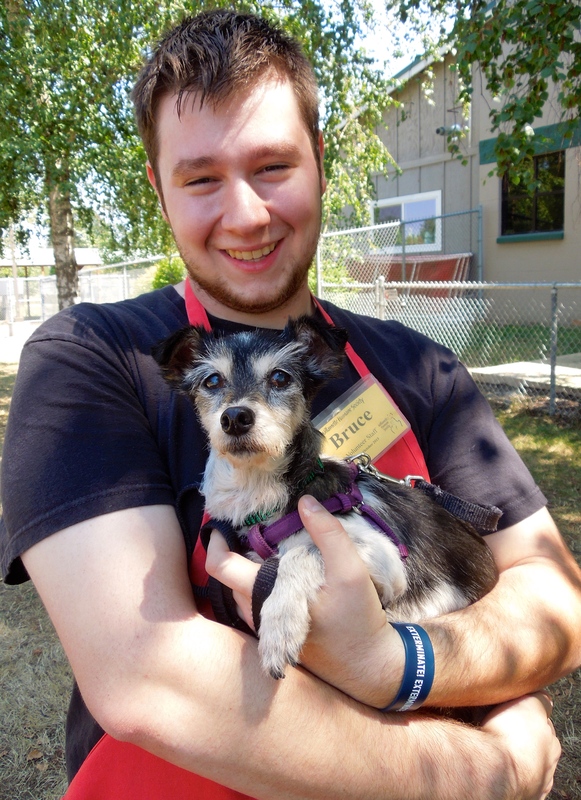 Scrappy has bonded with several of our male teens that spend time with our family. He prefers them to my daughter and myself but it is OK…. We love to share his amazing personality. Kayla, my 15 yr old daughter, is Scrappy’s main caretaker. He has had a huge impact in her life already. You can see by the pics that Scrappy is ‘her puppy.’ Right after we adopted Scrappy ‘Grampa’ got very sick with his cancer he had been fighting. Kayla was very close to her Gramps. During his last days Scrappy comforted Kayla as Grampa grew very weak. Eventually Grampa passed within just a couple weeks’ time of getting Scrappy. Scrappy was Kayla’s ‘go to’ for loves. What a huge blessing. Scrappy has also helped my husband a ton, too. It was my husband’s father who passed. 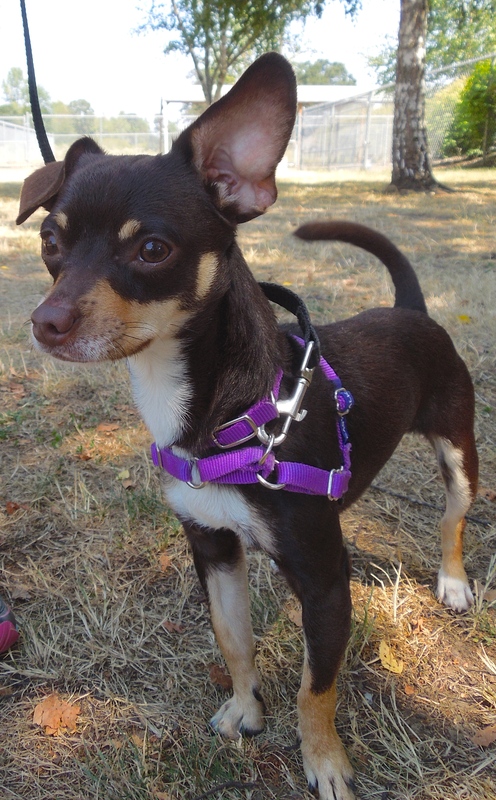 Scrappy has traveled to Seattle several times to be with family during this time and has traveled well and has done so amazingly well with all the new people and situations. Scrappy was at the ‘celebration of life’ for Grampa and everyone loved on him. He was a star!!! Sheila’s family sent along a new picture of a very contented girl and wanted us to know that she is a much-loved dog and doing great. 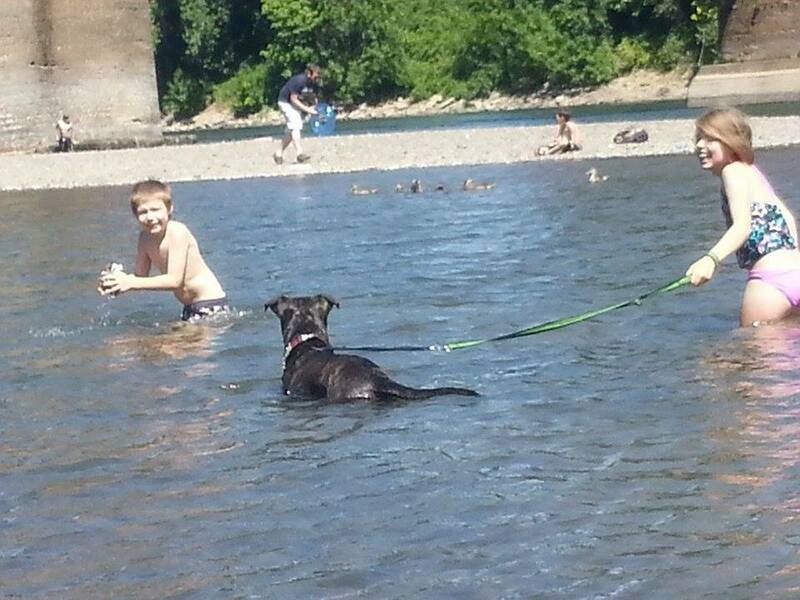 Luna’s family sent this picture of Luna, the water dog, having a great time with the kids. She, too, is a greatly loved girl. 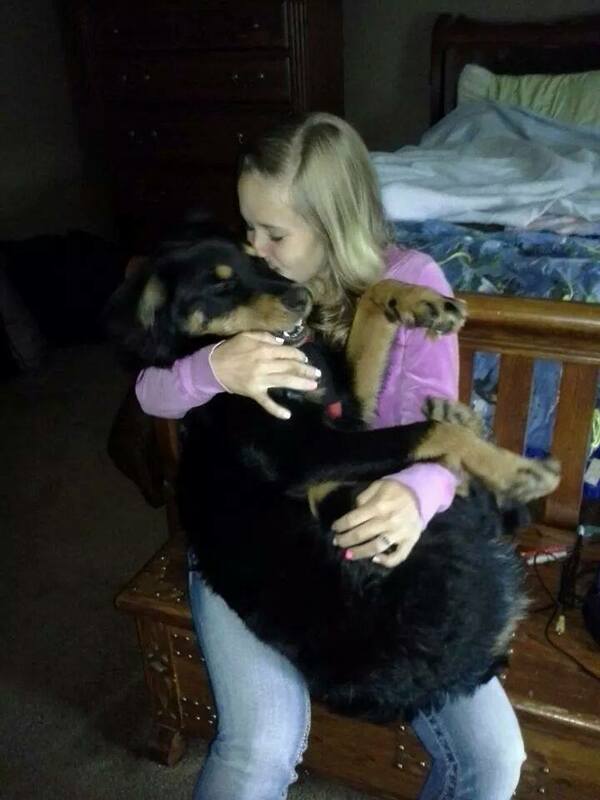 It is always such a joy to know that our former shelter dogs are in such loving homes.